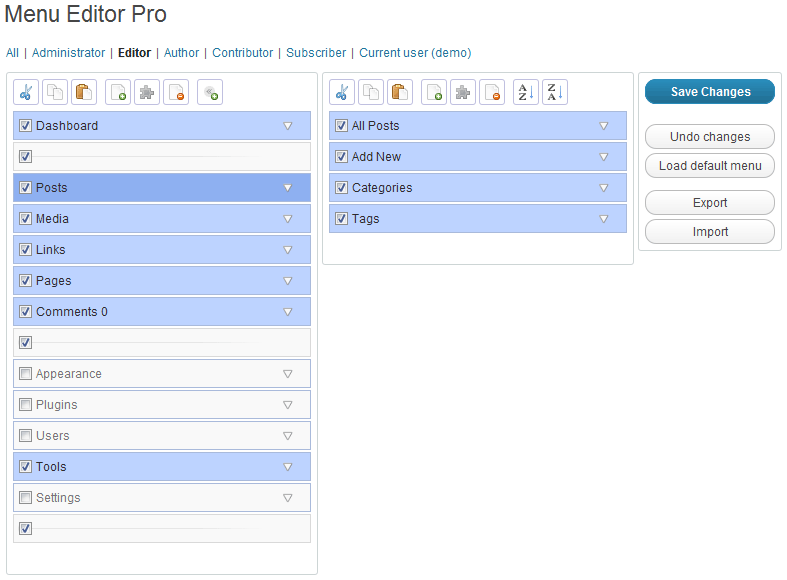 The Pro version makes it easier to set menu permissions for different roles. You can simply select a role from a list and use checkboxes to choose the menus that it will be able to see. You can also add exceptions for the current user and the super admin (on multisite/WPMU). This can be handy for client sites – you can give both yourself and the client Administrator accounts, but make specific admin pages only visible to you. + Import/export custom menu configurations. With just a couple of clicks, you can export your custom menu configuration to a file and download it to your computer. 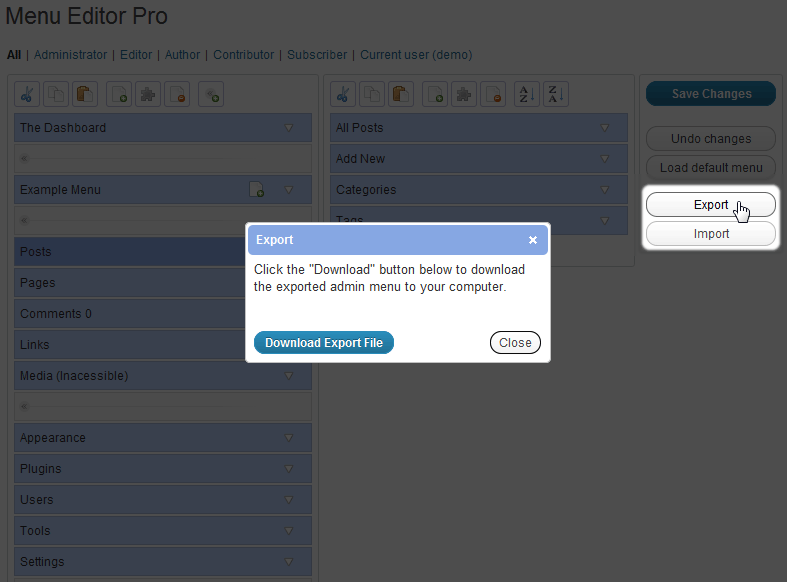 You can then import that custom menu on any site that has Admin Menu Editor Pro installed. + Create menus accessible only to a specific user, and more. In addition to the new role-based interface, the Pro version also adds an advanced “Permissions” screen that lets you fine-tune access settings for each menu item. For example, by setting the capability of a menu to “user:username”, you can make that menu inaccessible to everyone except that user. 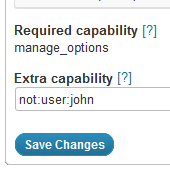 Or set the capability to “not:user:username” to hide it from a particular user. 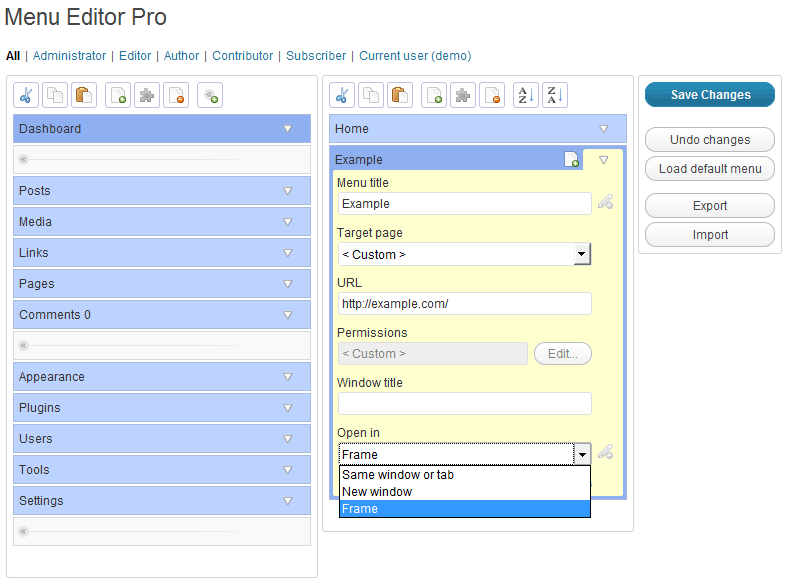 You can also combine multiple capability checks and usernames, use advanced capability syntax, and more. 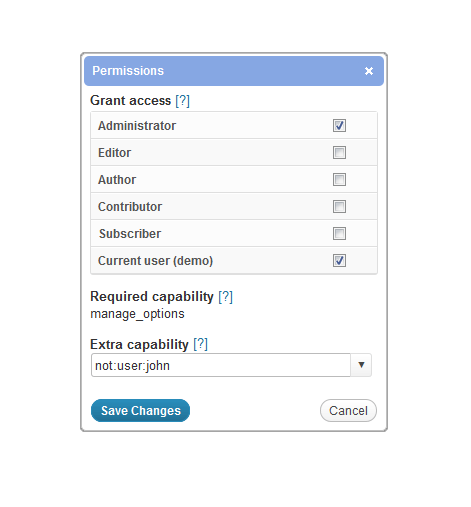 See Permissions documentationfor details. + Set menu items to open in a new window or IFrame. For example, if you’re building a site for a non-technical client, you can add a link to an external tutorial page to the menu and set it to open in an IFrame. 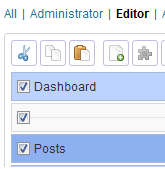 The page will then look like it’s part of the WordPress admin, with the admin menu and header still present. + Use shortcodes in menu fields. [wp-wpurl] – WordPress address (e.g. “http://example.com/”). [wp-siteurl] – Blog address (e.g. “http://example.com/blog”). [wp-admin] – Admin area URL (e.g. “http://example.com/wp-admin/”). [wp-version] – Current WordPress version. [wp-user-display-name] – Current user’s display name. [wp-logout-url] – A URL that lets the current user log out. Most shortcodes added by other plugins also work. This is useful for creating menu configurations that work on any site and don’t break when moving a site to a different URL.